It’s been a few months, but I’ve finally gotten back to Sloppy Joes. In my earlier attempt, I had a little pantry oversight (I really thought I had tomato sauce in there!) that led to an under sauced meal. After that tasty, but somewhat failed, attempt I resolved to revisit this messy childhood favorite. Brown the meat and the onion in a large skillet over medium-high heat for 5 minutes. Drain the pan. Add the garlic, jalapeno, and red pepper and cook 5 minutes more, stirring occasionally. 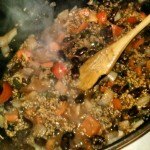 Stir in the rest of the ingredients, reduce heat to low, and simmer for 5 minutes more. This week, the results were much better, though not without a missed step or two. A proper amount of sauce was a huge improvement. You want the stuff to actually soak into the bun and drip, as well as tumble, out of the sides. However, I was a bit lax in my dicing and ended-up with slightly larger bits of onion and red pepper than I would have liked. The beans were also a bit on the big side–I only had a can of the large kidney beans about. As a result of the larger sizes of things, the mixture felt a bit more like chili than Sloppy Joes. On the next iteration, I’ll spend a bit more time with the knife. Though I’d like to improve on the sauce as well. The sauce was present this time and, though good, could be stepped up. There was mutual agreement at the table that the Sloppy Joe improved with a little dunk in some BBQ sauce. So why not take the Sloppy Joe sauce a bit more down the road from a chili to a BBQ sauce? I’m thinking maybe a bit more molasses might do the trick. And maybe, just maybe, a little more heat–though playing with some burn may need to wait until Take 4.